Experience the thrill of the hunt in a visually breathtaking, technically groundbreaking, vast open world. Explore the atmospheric single-player campaign yourself or go on the ultimate hunting trip with friends. Call of the Wild offers unique multiplayer options for up to 8 players. Steady your aim at the shooting range, drive ATVs, team up with other hunters and earn those bragging rights! Take on missions and challenges from the locals or go off the beaten path. Discover lookouts, hunting towers and outposts. Tired of walking between your hunts? Get the ATV Saber 4x4 and drive around! This capable vehicle will carry you across rough terrain at breakneck speeds. Exploring the open world has never been more fun. 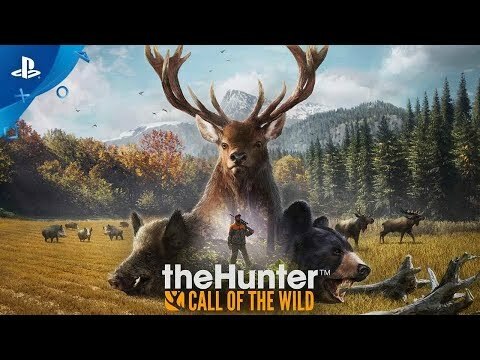 theHunter: Call of the Wild is the evolution of theHunter Classic, Expansive Worlds’ stand-out hunting game, with over 6 million registered players and 7 years of live operations. Acquire and equip a range of rifles, handguns and bows, and customize them with scopes and different ammunition types. Find and master your favorites. Practice and steady your aim at the shooting range. Develop your character by unlocking various skills and equipment. Learn how to use callers and scents, but, above all else, study your prey: pay close attention to animal behavior, traits and patterns of movement. In addition to its rich single-player experience, theHunter: Call of the Wild offers unique multiplayer options. Join up to 8 friends (or complete strangers!) in cooperative and competitive modes. Enjoy a wide range of in-game challenges and events. Hunting is more rewarding and exciting with friends, so share your experiences and earn those bragging rights. Head out with your friends using ATVs. Moving between hunting spots on four wheels is fast, easy and, most importantly, a lot of fun. Besides, after a long day of hunting, no one is going to turn down your invitation for an impromptu off-road race!